Make a necklace. 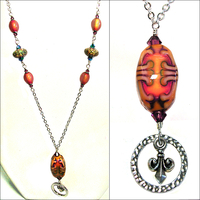 Harlequin custom designs necklace making project kits for beaders of all levels - from beginner to advanced. Kits include materials and step-by-step how-to instructions that are easy to follow. Jewelry kits also make wonderful gifts, especially for those who are new to beading. Design your own necklace by putting your personal twist on our design idea. Choose just the items you need from our materials list, and follow instructions that are always available online to help you complete your own necklace design. You can also learn basic beading techniques online by following our free jewelry-making tutorial videos.